Fr8Partner (pronounced FreightPartner) is both the name of our company and the excellent tool, that we would like to present to you here. Global supply chains are extremely complex and require professional knowledge and training. Not surprisingly, it is an equally complex task to choose the right freight solution. This is where our intelligent freight tool Fr8Partner can really make a difference. After entering the individual offers from your forwarders into Fr8Partner, you just choose the mode of transport (air, road, sea or parcels), quantity and destination, and our tool will list the relevant offers on the display page with the most advantageous offer at the top. Other factors like e.g. freight rate versus transport time is also shown. With Fr8Partner, your staff will be able to find reliable information re. cost and transit times within seconds and regardless of department - be it sales, logistics or warehouse. And this without having to go through complex freight offers, extensive zone charts, price tables etc. Even the relevant contact data for the individual forwarder is shown. An e-mail for the booking department is generated with a few clicks or you may be sent straight to the booking page of the chosen forwarder. This will save both time and unnecessarily high freight costs – simply by avoiding the costly shipping options that could so easily be the result of a lack of time and overview. Another great advantage is that the information is always up to date and accessible. E.g. if an employee is absent for any reason, another member of your staff may easily take over and find the right forwarder - and price - for the job at hand. And there is much more! Click here see all the reasons for choosing Fr8Partner. Finally available: A tool which is easy to use and which compiles all freight offers and quotations in one place – parcel delivery, road, sea or air freight alike. And which can be used across your business. Fr8Partner is the first tool of its kind on the market. It has been developed and designed by experts who know both the day-to-day business of the customers as well as the freight world from within. The tool can be tailored to fit the individual requirements and needs of each customer which makes it both unique and highly usable. Fr8Partner uses standard web browser technology for the daily usage and applications. The freight templates are based on Excel. This makes it very user friendly and easy to enter data. It does not require in-depth IT skills – a basic knowledge of Excel is enough. By gathering all forms of transport and types offers in one and the same tool, it gives you maximum transparency and makes it both easy and quick to compare relevant offers. Individual customization according to your own wishes and needs. Overview and transparency of all offers and information. Easy to use - even without prior knowledge to the 'freight world'. All data is stored on secure servers according to EU guidelines. Telephones ringing non-stop, inbox overflowing… You may not always have the time to go through all options to find the most financially sound solution during a hectic working day. This is where Fr8Partner can help you. All you need to do is to enter destination and volume, and our web-based tool will display the most profitable options for you to choose from. 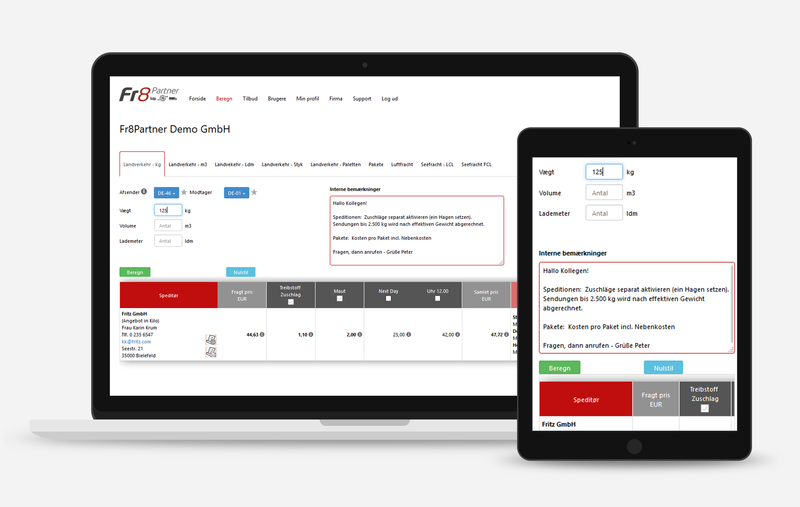 When all freight offers and quotations are entered into Fr8Partner, the calculations and information is displayed in a structured overview page which makes it easy to choose the best solution. The Fr8Partner tool can be used across the entire business, e.g. by the sales, purchasing and logistics departments, and provides current and updated quotations where and when needed. Staff in other departments, e.g. in sales or customer service, will also be able to quickly compare cost in relation to transit time (eg. standard or express delivery). And entirely without consulting zone charts, tariff tables, diesel surcharges, transit times or bothering their colleagues in the shipping department. With Fr8Partner it takes our customers just moments to get an overview before deciding which form of transport to use. This will help you can save not only valuable time but also excess freight charges. Should you choose air freight, parcel delivery or courier? Should 20 m3 be shipped as LCL or FCL? Gathering all freight offers and prices in one place gives you a unique overview. Fr8Partner does the calculations within seconds and displays the best options for you to compare. Fr8Partner does more than compare freight rates – it also incorporates information about transit time, collection days, surcharges, contact data for the various forwarders, etc. It has never been easier to compare freight offers and make the right decision for a given job. It may be difficult to find the time for the initial data entry process. Let us help - call us for an offer. At the office, on business trips or meeting customers: Fr8Partner is designed to be available when and where needed. This has been achieved by using a web-based platform rather than a classical software solution. This means no tedious and time consuming software installations. All you need is internet access and a web-browser! Fr8Partner’s dynamic web-design ensures that functionality and content is always the same - whether you use a computer, a tablet or smartphone. This way, Fr8Partner takes usability and flexibility to an entirely new level. A smart tool indeed! The many advantages speak for themselves! This smart tool doesn’t only help you reduce transport costs, it also frees valuable time on an everyday basis. Gone are the hours spent on going through complex freight offers, tariff charts, etc. as Fr8Partners does the hard work for you. Storing all your freight offers and data in one central location also means that it is always up to date. An added bonus is that the information is available across the business at any given time. E.g. in the case of absence due to illness or vacation, this will allow a replacement or less experienced colleague to take over and still choose the best transport solution even if they are not trained shipping professionals. Fr8Partner’s true strength are the people behind the tool. Even though the team includes professional software designers, it is first and foremost the experienced logistics and shipping specialists who know the business inside out who have been the driving force behind the design. Our promise to our customer is that we will keep investing in the development of Fr8Partner so it will continue to be the unique and indispensable tool it has become. In the end, your satisfaction is our primary goal.